Counterbores the back of a 5/16"-diameter peghole to fit Grover and Gotoh sealed gear housing.Here's a tip from our luthier friend Bryan Galloup: Grover and Gotoh tuners with threaded bushings should be installed in counterbored pegholes. A snug 5/16" diameter at the top of the hole stops the bushing from leaning under string pull, thus helping to protect the lacquer finish around the bushing washers. 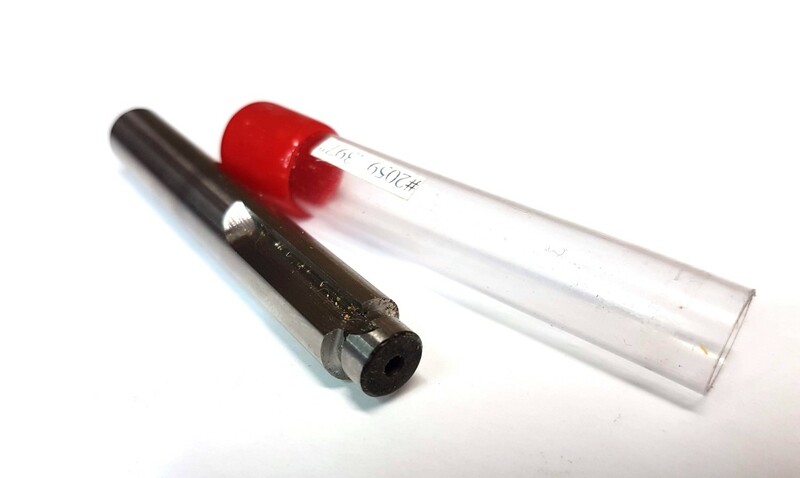 At Bryan's suggestion, we developed this special slow-speed steel reamer that accurately counterbores the bottom of the peghole to fit the gear housing. The reamer has a .310"-diameter (7.87mm) pilot and two flutes that cut a .397"-diameter (10.08mm) counterbore in a 5/16"-diameter (7.94mm) peghole. When the reamer's piloted end is flush with the face of the peghead, the correct counterbore depth has been reamed.